I made this card for the wedding we're attending tomorrow, using several layers of the Bloomin' Love heart glued together. 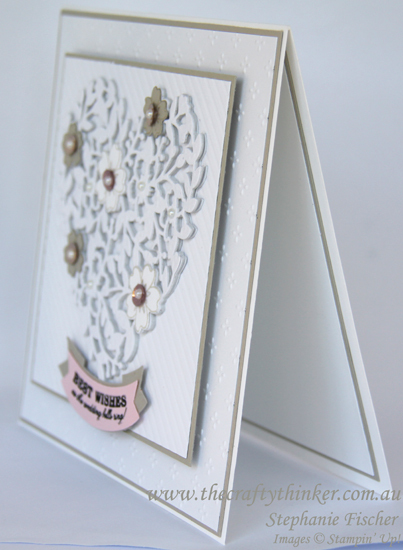 The little flowers in Whisper White and Sahara Sand were cut with the same die set and stamped with the matching Bloomin' Love stamp set. I found the easiest way to perfectly match the stamping and die-cutting was to cut first and then stamp with the help of my Stamp-A-Ma-Jig (the opposite to what I would normally do!). The centres are sequins from the new Fancy Frost collection in the new Holiday Catalogue with the addition of little pearls. It's hard to see in the photograph but I've used three of the designs from the Fancy Frost Speciality Designer Series Paper and left them in their natural white state. The banner was cut with the Duet Banner Punch with one Sahara Sand layer and the top layer is Pink Pirouette. I stamped the greeting from the Seasonal Bells stamp set (in the new Holiday Catalogue) by selectively inking the part that I wanted to use with a Basic Black Stampin' Write Marker. 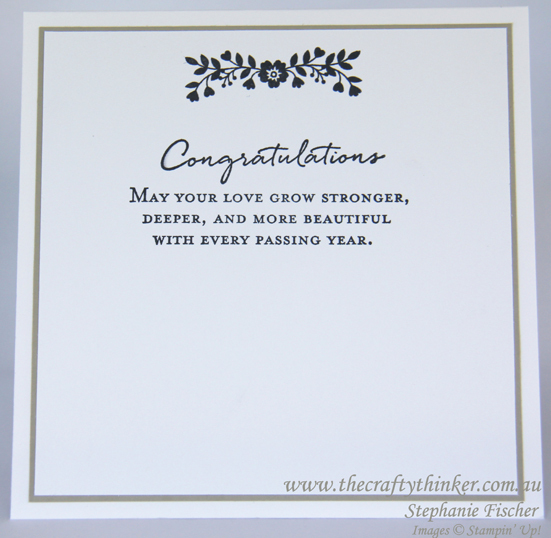 The inside of the card is layered with Sahara Sand and Whisper White cardstock and stamped in Basic Black ink using the Floral Phrases stamp set.